Have you ever done something that you REALLY wish you hadn’t…? When Katie decides to mummify her dead, pet goldfish she has no idea what she has started. For then there is a theft …and an ancient and malevolent power is unwittingly unleashed to hunt down her brother, Josh. Can Katie, Josh and Andy discover an antidote before it is too late? And why is it so vital to find the writer of the mysterious book..? 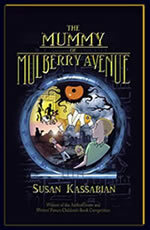 Winner of the AuthorHouse and Writers’ Forum Children’s Book Competition. Get updates on book signings and the forthcoming sequel! Buy the e-Book for £0.99!